Hesperian now offers a variety of digital tools for health promotion, designed for people with limited computer or internet access. Each tool represents thousands of hours of writing, production, field testing, translation, and digital adaptation. Taken together, they form the Hesperian Digital Commons, a collaborative project to re-imagine our trusted print materials through the innovative use of technology. Immediate online access: The HealthWiki provides content in a flexible, wiki-based format — well suited for low or intermittent networks. 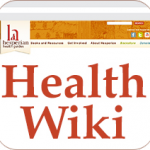 The HealthWiki facilitates online searches by topic and across multiple languages. Read on a tablet: Where There Is No Doctor, Recruiting the Heart, Training the Brain, and our three environmental health booklets (Sanitation and Cleanliness for a Healthy Environment; Pesticides are Poison; and Water for Life) are now available as Ebooks! Download health information: Our books continue to be available for free PDF download. Now in English and Spanish! Hesperian’s award-winning Safe Pregnancy and Birth app for iPhone and Android presents life-saving information using clear language, step-by step instructions, and illustrations. If you don’t have a smart phone, you can preview the app online. Have you created your own materials using Hesperian text or images? Share your materials with us at [email protected] and help us build an online resource library! See our open copyright policy. Write to us at [email protected] to learn more, and please consider making a donation to support this initiative!